Note: The Sticky Player is a new feature added in Version 2.6 of the Smart Podcast Player. In Version 2.8, we added the ability to add different sticky players to separate pages on your website. What Is the Sticky Player? The Sticky Player is one of the three podcast players that comes with your monthly or annual Smart Podcast Player subscription. The Sticky Player is similar to the Track Player, in that it plays a single episode of your podcast at a time; it is different in that the Sticky Player is designed specifically to "stick" to the bottom or top of your website. As your website visitor scrolls up and down the page, the Sticky player remains stuck to the top or bottom of that webpage, where as the Track Player remains in one location on the webpage. The Sticky Player also extends the whole width of your website page. So, now, as of Version 2.6 of the Smart Podcast Player, subscribers get three unique podcast players for a single subscription! 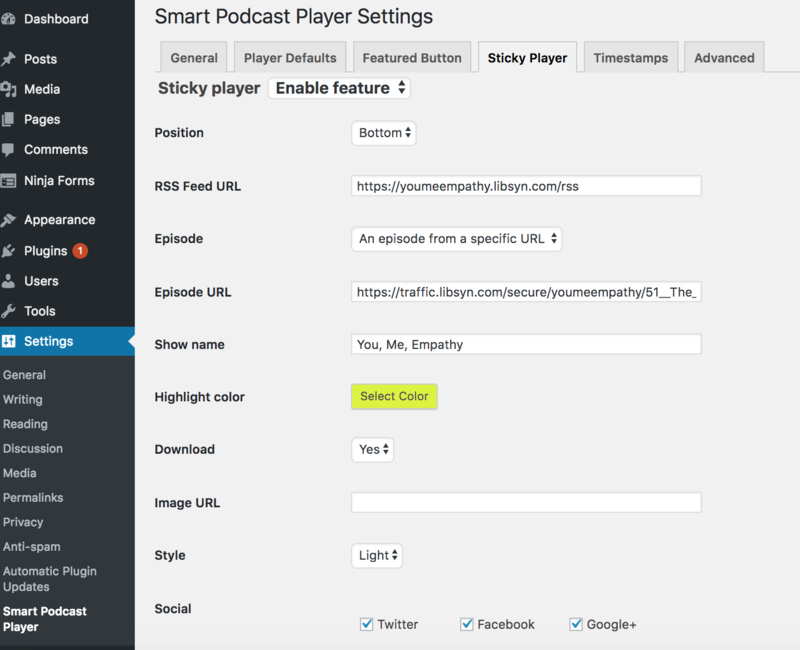 To enable the Sticky Player on your WordPress website, go to your WordPress dashboard, head to Settings > Smart Podcast Player, and click on the Sticky Player tab. The default setting is Disabled. Switch to Enabled to enable the Sticky Player. Open up the WordPress editor for the page where you would like the unique sticky player to appear. In the main body of the page, create your Smart Track Player shortcode [smart_track_player] as you normally would. When you add sticky="true" to your shortcode, the track player will be displayed as a sticky player, rather than in-line on the page. Wherever you add this separate sticky player shortcode, this will override the sticky player track you've specified in the Smart Podcast Player settings. For those pages where you haven't specified a unique shortcode, they will defer to the Sticky Player tab in the Settings menu. To access your Sticky Player settings, from your WordPress dashboard go to Settings > Smart Podcast Player, and click on the Sticky Player tab. Enable feature / Disable feature: In Enable feature mode, the sticky player is enabled (or active) on your WordPress site. In Disable feature mode, the sticky player is disabled (not present or active) on your WordPress site. Position: Your options here are Top or Bottom. If you want your Sticky Player to appear at the top of your website, choose Top. If you want it to appear on the Bottom, pick Bottom. RSS Feed URL: This is where you want to add your podcast RSS feed URL. The Sticky Player will either play the most recent episode from your podcast RSS feed (just like the most recent function in the track player), or, based on what you designate below that in Episode, play a specific track (NEW in Version 2.7!). If you leave the RSS Feed URL blank, it will pull from your podcast RSS feed URL you have in your Player Defaults. Episode: You can either choose Latest episode in your feed, which will pull the latest episode from your feed, or an episode from a specific URL, which will allow you to pick whichever Episode URL you want from your feed. Show Name: Add your show/podcast name (e.g. Smart Passive Income Podcast) here. Download: Choose Yes to enable your listeners to download your podcast file, or No to disable downloads. Image URL: Add your podcast image URL here. Use a square image that is at least 300 x 300 pixels in size. Style: Your options here are Light or Dark. For more information about Light vs. Dark styles, go here. The Blurred Logo option is not available in the Sticky Player. Social: Pick which social platforms you want to your listeners the options to share to. Options include: Twitter, Facebook, Google+, LinkedIn, Pinterest, and Email. Excluded Pages: By default the Sticky Player will appear on every page of your website when you have the Sticky Player feature enabled. If you want to exclude the Sticky Player on specific pages across your WordPress website, you can add those page URLs here in the Excluded Pages box. Note: Excluded page URLs should be added one per line. CSS Z Index: The z-index brings the player closer or further from the listener, so if there's something else in the same place in the window, this tells the browser which one to show. Post Types: if you have defined any custom post types, you can have the sticky player show up there using this option. Extra Shortcode Options: You can also add extra shortcode options for your Sticky Player in this box.